Preheat oven to 450 degrees. Shred brussels sprouts using slicing disc in food processor or by hand. Place in a bowl with apples and olive oil; toss well and season to taste with salt and pepper. Roast 15 minutes until just tender. Place balsamic vinegar and honey in a shallow saucepan; reduce to 1/4 cup. To serve, place roasted brussels sprouts and apples on serving platter. 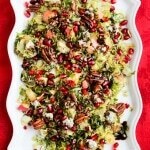 Sprinkle with pomegranate seeds, blue cheese crumbles, and toasted pecans. Drizzle with some of the reduced balsamic vinegar (you will not need to use all of it).